Was born in Oshodi, Lagos state of Okpella parents. He had his primary and secondary educations in Lagos before proceeding to Canada for further education. He qualified as an Architectural Engineer, and joined the Federal Ministry of Works where he served as a Chief Technical Officer till he retired from service. 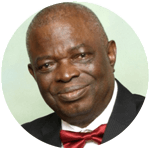 He is the AGO (Northern Nigeria) of Jesus is Light Ministries, a senior Pastor and graduate of Jesus is Light Ministries Bible School and happily married to Elder (Mrs) Florence Alabi and blessed with many children and grandchildren.